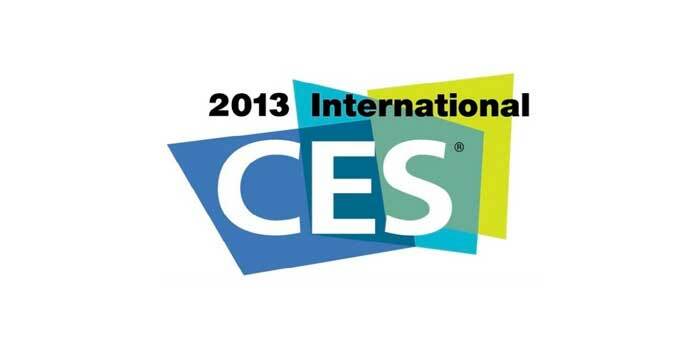 Just a day for the gala CES 2013 event to finally kick off in Las Vegas with press conferences of respective companies to be held at first followed by the launching of the event on January 8th. Samsung has already revealed a number products that they will be showing off in the event and it seems that Samsung with its diverse range of products might grab the CES trophy sending a strong message to its arch rival Apple. The vacuum tube soundbar, code HW F750, promises to satisfy the consumers want for a natural and clear sound by adding. as the name suggests, a vacuum tube amplifier in the soundbar. As most of the sound devices gain attraction by being wireless, so does this awesome piece here. It would enable the users to activate it with TV via bluetooth technology making things work much more easier. 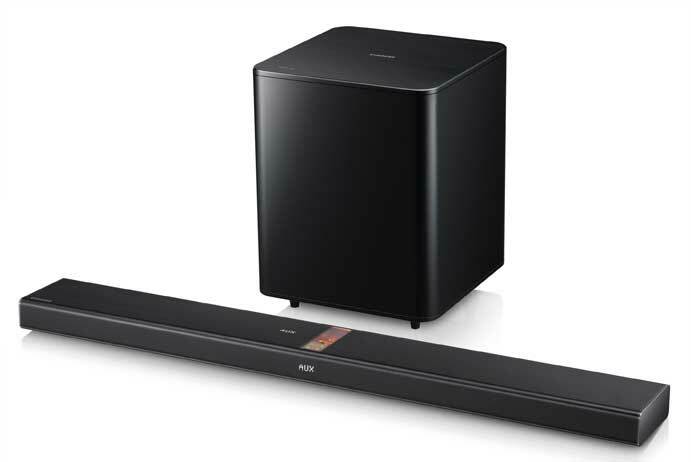 This soundbar has a sensor called the gyroscope enabling it to measure the rotation, slope and height of the device. This is done so that the device can make genius calculations to give out better sound quality based on those variables. To make it even more attractive, the device features an AirtrackON function which automaticaly switches on the soundbar as soon as the TV is simultaneously switched on. The portable wireless bluetooth speaker, code DA- F60, is a speaker for all those who have a smartphone or a tablet with the NFC functionality. With just a simple tap between the two devices, users can easily pair both in seconds. 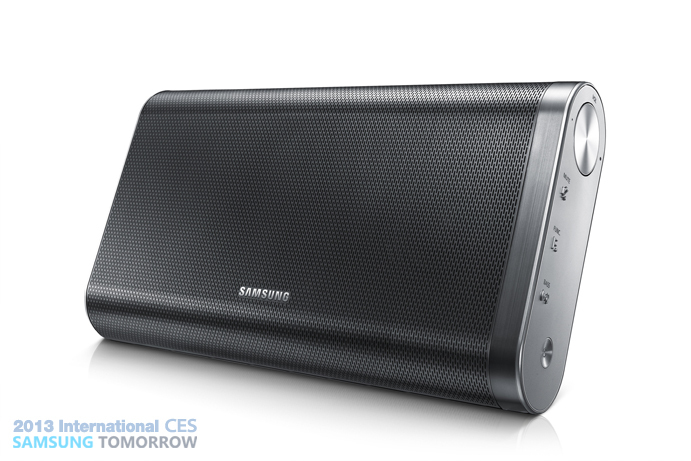 It would also be possible to connect the wireless speaker with a TV using the bluetooth technology. 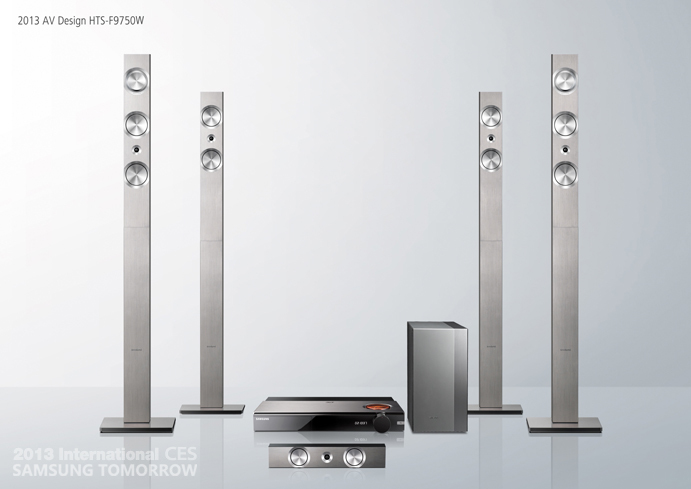 This home theater system was created to perfectly pair with the upcoming Samsung 2013 TVs. It contains a Gallium Nitride amplifier (reminds me of chemistry!) to deliver pure an natural sound to the users. 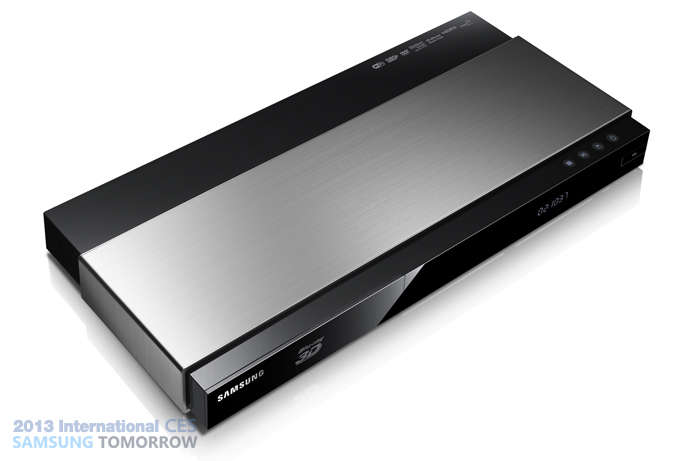 We might think that both DVD and Blu Ray are already becoming obsolete but Samsung here is denying that fact by releasing a new premium blu-ray player aesthetically crafted with the power of transforming any HD or SD content into a much more better resolution, somewhat close to that of the Ultra HD Display. 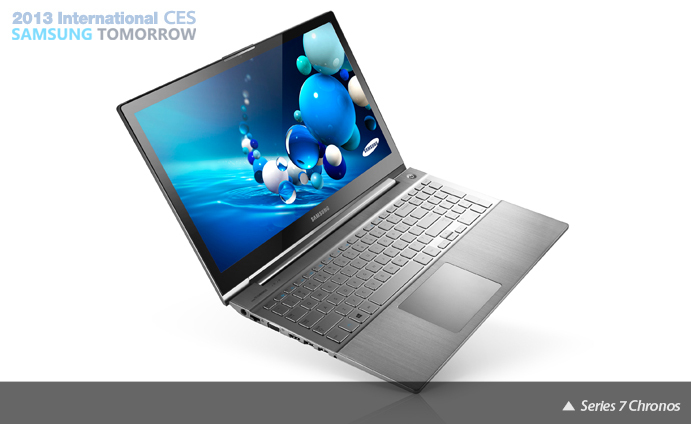 According to Samsung, the series 7 Chronos is a high end laptop delivering a powerful performance upto 150% increase in speed for browsing the net and running applications. Chronos will be powered by Intel quad core processors, i Series, storage capacity upto 1TB and upto 16GB of RAM. To enhance the display, Chronos will be supporting upto 2GB of external graphics and with such high specs, this device can also be regarded as a perfect gaming laptop for those gamers out there. As other Windows 8 laptops, the display is touch screen with 10- finger multi-touch capabilities sure to give users a feel of a tablet. 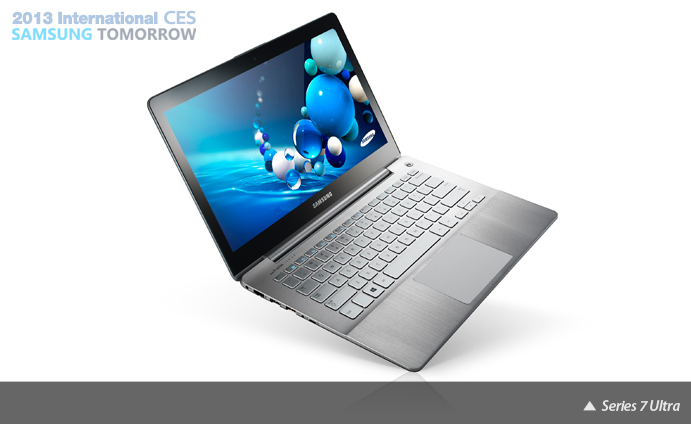 On the other hand, Samsung will also release the Series 7 Ultra which is the first Ultrabook in this series. This Ultrabook has a 13-inch screen, full HD with 350nit brightness, a little more than that of the Chronos which has a 300nit brightness. To spice it up, it has JBL optimised speakers integrated in it to provide better sound quality and AMD graphics card to strengthen the display. This camera is more like a slim camera, like the cybershot, and a DSLR combined. 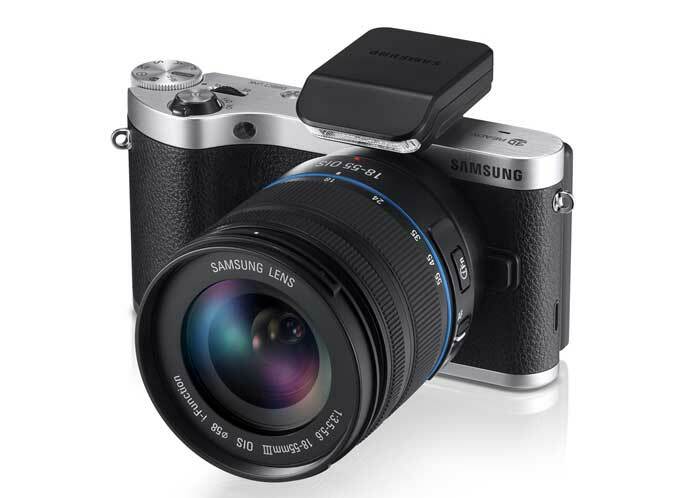 The NX 300, a 20.3 megapixel camera, enables the user to take perfect 3D quality images and video with the newly released lens, NX 45mm F1.8 2D/3D. Moreover, the camera has a wide ISO range from 100- 25600 enough to light up images even in the darkest environment. The NX 300 has a 3.31-inch AMOLED screen which of course would make the picture preview much more clearer and brighter. Also, the screen can be tilted making it possible for the user to take both high angle and low angle shots. 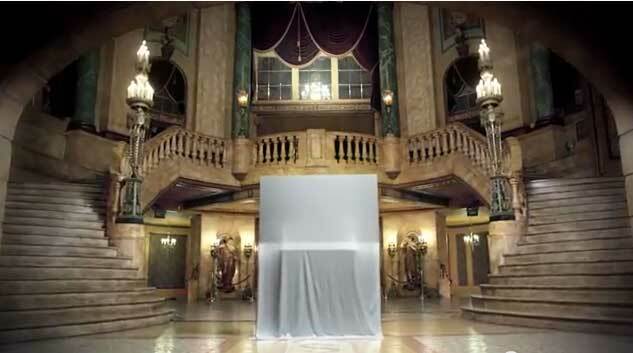 Still not sure what this TV will actually be like, but from the teased picture in Samsung’s blog, the TV might be portrait in shape. 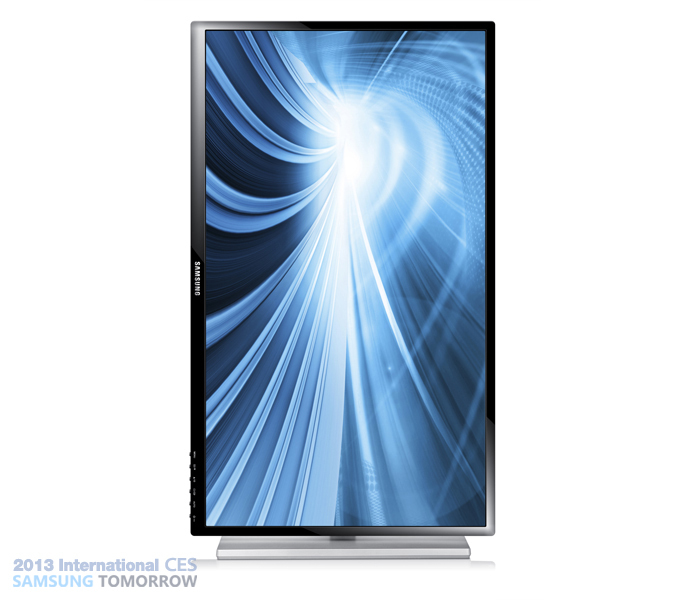 Normally we see TVs being rectangular but Samsung might have wanted to take things differently by releasing this unique TV. We can only find out what this is once the event kicks off! The Series 7 Touch SC770 is a monitor specially optimised for Windows 8 with a resolution of 1920 x 1080p and of course a touch screen. It has an adjustable stand which can be titled and used comfortably up to 60 degrees. If you intend to use all your fingers on the monitor, no problem, it will be able to identify all of them! 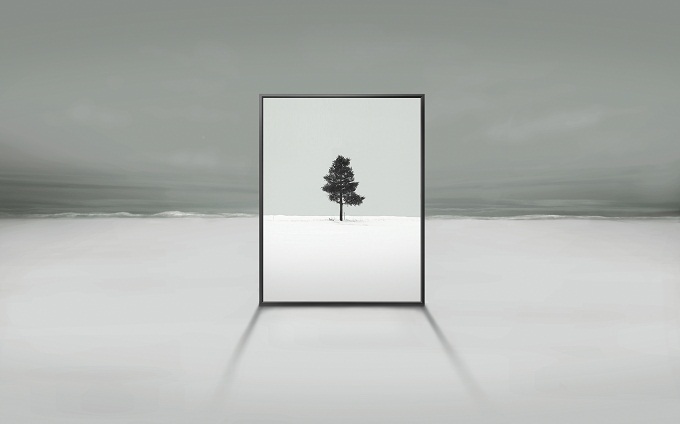 The other non-touch screen monitor SC 750 is a 27 -inch monitor which can be rotated to 90 degrees giving the users an option to either view it in a landscape or a portrait mode. 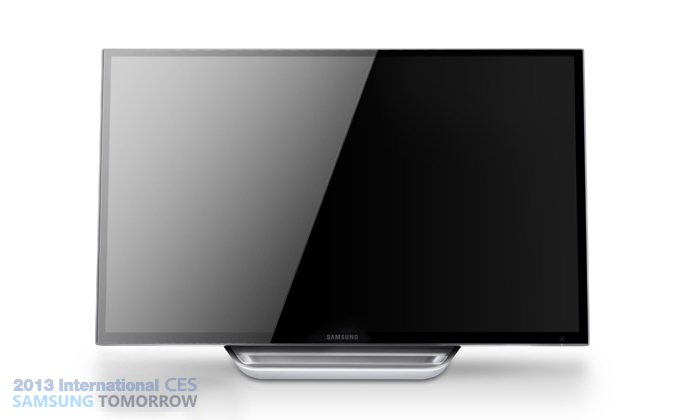 It was speculated that Samsung would be unveiling its 85-inch Ultra HD TV in CES 2013 which is by far the largest 4k Ultra HD TV, with a display of 4×1080 pixels, to be in the market. The TV will be using an innovative enhanced dimming technology with a very high contrast ratio to deliver detailed crystal clear pictures and also offering a ‘powerful and dynamic’ range of sounds. Out of all the devices listed above, this particular one is the most anticipated one of all. With so many rumours flying around the web predicting the release of the next Galaxy series in CES, Samsung hasn’t really given us any bit of information about it. Maybe they are keeping it a secret and wants to surprise us? Folks at ubergizmo reported that the SIV wont make it to this event and recently posted another story where it said that Samsung would be bringing the SIV device not for us, but for the top level executives. If this is true, let’s just hope one of the executives takes a quick snapshot and posts it online! For general people like us, all we got to do is wait to hear from Samsung. That is definitely interesting and cool gadgets for this year 2013. Samsung devices are really the best and thanks a lot for sharing this. Glad you found it interesting Donna 🙂 Samsung is truly the best company out there. 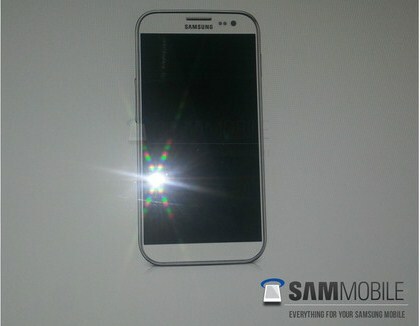 Watch out for the Galaxy SIV, I am sure they are going to surprise us with it! It seems Samsung will be ruling the tech market in the coming days. Totally agree with you Michael! Long way back, we used to see washing machines or refrigerators from Samsung and now, it’s all changed. Let’s see what they have for us in this year!